As of today, the mother of the murder suspect who killed at least one person in Charlottesville Virginia during a white supremacist rally, told reporters that all she knew the last time she talked to her son, is that he was going to an “Alt-Right” rally. She had no idea her son was a racist — or did she? Racism is the elephant in the room in America — particularly, white America. White people would like racism to go away. The thought that their ancestors could have been slave owners is an embarrassment to most. Racism is complex in scope because it is both a mental illness and a value. In other words, it is a valued, sheltered, and protected mental illness. One might even say it has been incubated and allowed to fester throughout the course of American history. Mental illnesses are health conditions involving changes in thinking, emotion or behavior (or a combination of these). Racism meets those criteria. Like all illnesses, it needs to be treated in order for it to be cured. The problem, is that we do not see racism as a problem, because we do not see it for what it is — an infectious disease that has been an epidemic plaguing our nation. Epidemics can spread rapidly and can be notoriously difficult to treat. In the medical field, the way to stop an epidemic is to educate and involve the general population on what the symptoms are in order to prevent spreading the disease. If the symptoms are not recognized, then the disease spreads and exacerbates. It can and will harm many people over the course of time — which racism has. The mental illness that is racism has killed thousands upon thousands of people of color, particularly, African-Americans and Native Americans. The murders in Charlottesville Virginia would be considered an outbreak of the disease. Without swift and timely containment, it will only further spread and spur new outbreaks. To prevent the disease, it is important to know the signs. Like many diseases, the symptoms can appear subtly, and if not treated, will get worse and become untreatable. 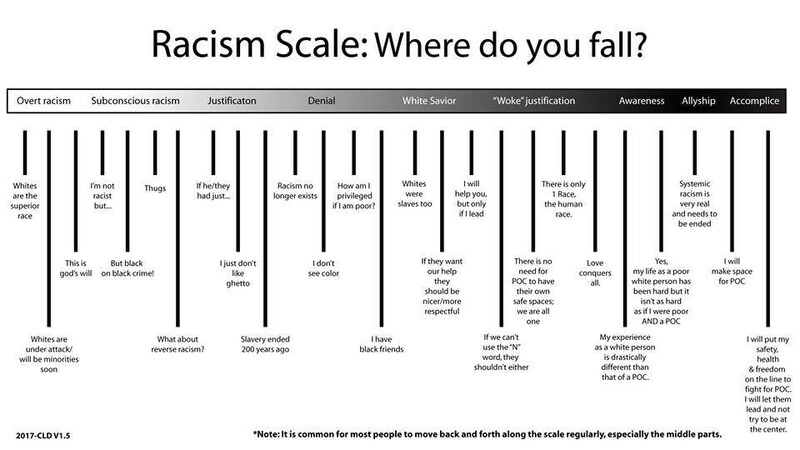 Review the “Racism Scale: Where do you fall?” below to begin to explore and understand whether or not you have symptoms. If you fall below “awareness”, then this is a red flag that racism is a problem for you. If it is not a problem for you, but find that it is a problem for your family members and/or friends, then it’s time to address it or it will continue to spread throughout America. There is no easy way to contain a disease, but if we can identify the symptoms, then we can put a stop to it through education and awareness. Since writing this article, I have to say, that when I wrote this article I was knee deep in racial trauma. In this article, I asked that white people perpetrate what I now call (Racist) Projection, which I write in my mini e-book. When it comes to anti-racism work, it is important, to be able to identify your unconscious racism by getting an intervention. If and when you get an intervention, you will be able to learn how to act in anti-racist ways. At this stage of my work, I had not healed from my racial trauma. This content was deeply influenced by my racial trauma. Whenever a (POC), such as myself, asked whites to perpetrate this behavior, it is a clear sign of racial trauma. I could have deleted this article, but I chose not to. I wanted this to be a reminder and lessons for all whites and (POC), that we all have a lot of inner work and inner healing to do. I am proud to say, that now, I have healed from my racial trauma and it no longer influences the way I see racist behavior in society. 8/17/17: I just published a follow-up article to this piece. It is titled The Failure of Acknowledging Racism as a Mental Illness in America. 8/20/17: If you would like to know when is the right time to confront a friend or family member that is racist, then read my article titled The Right Time to Confront Someone You Care About Who is Racist.